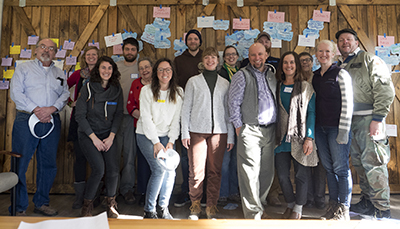 Members of Louisville’s Urban Agriculture Coalition gathered recently for a planning retreat to set the coalition’s work plan for 2019 and beyond. The coalition formed in 2016 as a working group of the Food In Neighborhoods Community Coalition to bring together community members and organizations working on urban agriculture efforts throughout the city. The day began by discussing what attendees liked about urban agriculture in Louisville and what they felt was missing. There were many more things folks liked and thought were missing. You can see the summary of the meeting below. 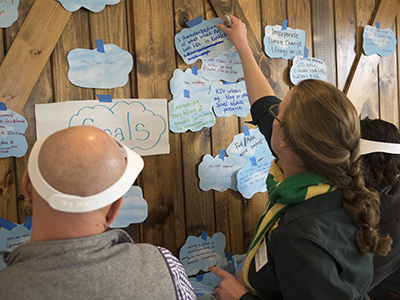 The group then went on to share their individual and organizational goals for 2019 to see where those goals would address any of the ‘What’s Missing’ previously shared. There were a lot of connections between the two! This really helped the group to understand who was already planning to address some of the issues and where there was more work to be done. We then further analyzed the goals by comparing them to various city-wide studies and plans that identify priorities from residents and government officials on what they are working on to improve the quality of life in our city. Those documents included the Comprehensive Plan 2040, 2016 Sustain Louisville progress Report, 2017 Health Equity Report, Jefferson County Cooperative Extension’s Plan of Work, 2018 Farm Bill, Preliminary Resilience Assessment, and the Hunger Innovation Fellowship’s data. We found many overlaps between what the UAC and members are planning and priorities set by these studies. The day wrapped up with an exercise to identify our goal areas for the year. The broader categories are education, policy and Connections/collaborations. During our February meeting we will set concrete actions within those categories for this year and for the future. If you would like to attend the next Urban Agriculture Coalition meeting, it is scheduled for Wednesday, February 27th from 12-1:30 p.m. in the second floor conference room of Catholic Charities above The Common Table, 2234 W. Market Street. We look forward to having you there! For more information on the Urban Agriculture Coalition, visit the our website. 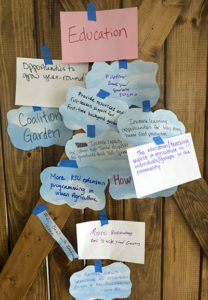 The Food in Neighborhoods Community Coalition (FIN) was formed around 2009 from a group of community members and organization representatives to support community efforts to build a just, healthy, and sustainable food system in Louisville, Kentucky. FIN became a food policy council under the city’s leadership and then in 2013, that council was dismantled, leaving FIN to pick up the pieces and try to regroup. The coalition continues to bring people together around its mission and is currently made up of 3 working groups: Policy, Urban Agriculture and Food Security. It meets for a quarterly meeting to hear from each working group and hear from folks about their current concerns. The Urban Agriculture Coalition began meeting in November of 2016. At one of our initial meetings, we discussed linking up with FIN as a working group since our goals lined up with their goals. 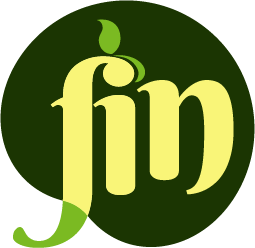 We have been a working group of FIN ever since and last year launched our website as part of their new website, foodinneighborhoods.org/grow. Core group of people who are dedicated to more urban ag. Goal: To finally prune our hardy kiwi properly and get some fruit!